Posted: Tuesday 24th April 2018 in eCommerce Technology, News, Retail Strategy. In 2009, Alibaba created Singles Day, which has since grown to become China’s biggest online sales holiday, producing more revenue than Black Friday and Cyber Monday put together. And of course there’s Amazon Prime Day, the online retail behemoth’s July 15 sale in which generated more than $2.4 billion in sales last year. Now, Wayfair is getting into the act with its first inaugural Way Day. On April 25, the home goods retailer will offer discounts on approximately 70,000 of its more than 10 million SKUs. 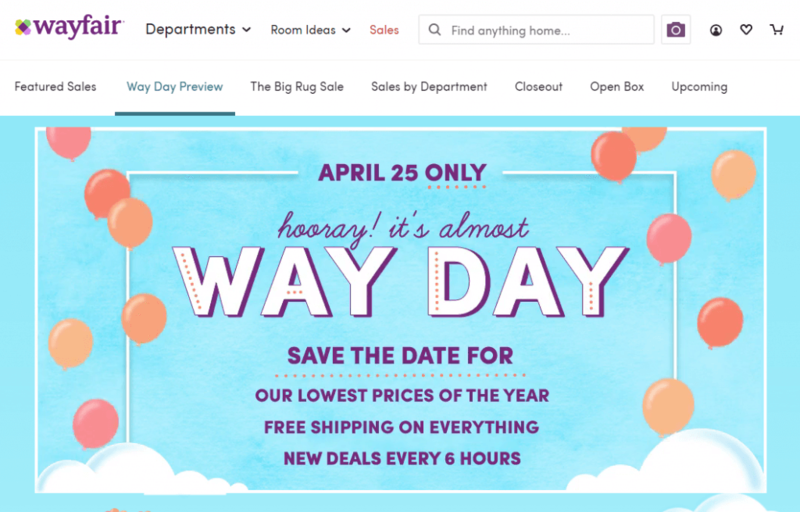 According to Liza Lefkowski, Wayfair’s head of brand and promotions, the April 25 date is designed to capitalize on increased demand for home goods in spring. The multi-million dollar question: will Wayfair be successful in launching its own sales holiday? The company is promoting Way Day prominently on its website and through a marketing campaign that spans digital channels and television. But despite the fact that it’s a large retailer that ranked 16th on Internet Retailer’s Top 500 list, it’s a lot smaller than Amazon and Alibaba. Scale. Even though Wayfair isn’t nearly as big as Alibaba and Amazon, it is by no means a small retailer. Obviously, to pull off a sales holiday, a retailer has to have a large enough business to realistically distinguish a holiday from a sale. Trends. Wayfair timed Way Day to coincide with an uptick in customer interest it has identified occurs in spring. Any retailer looking at developing a holiday would be wise to look for trends, seasonal or otherwise, so that they can try to tap into a source of interest and demand that already exists. They would also be wise to identify the products that should be included in the sale. Branding and awareness. To successfully pull off a sales holiday, retailers need to be prepared to make a hard investment in branding the event and creating awareness about it. While a successful sales holiday can pay off, and require less and less paid promotion each year if it becomes a thing, getting one going realistically can’t be done without spend. In other words, to make money, retailers need to spend money. Competition. Retailers that create their own holiday will need to be prepared for the possibility that their competitors will try to capitalize on the event, which could blunt some of the anticipated upside. For example, despite the fact that Prime Day is no doubt a boon for Amazon, other retailers are increasingly seeking to woo consumers on and around Prime Day. Last year, a group of large and diverse retailers, including Walmart, Best Buy, Kohl’s and Newegg, took aim at Prime Day with sales of their own. Because the retail landscape is changing and traditional holidays typically associated with sales events are no longer as important thanks to ecommerce, it’s likely that Wayfair won’t be the last retailer to take a page out of the Alibaba and Amazon playbooks and attempt to replicate their tactics in some fashion, albeit on a smaller scale. As sales holidays like Way Day become more common, retailers will be able to glean more insight into what works best and what doesn’t work so well. And consumers might find they have reason to celebrate more frequently.